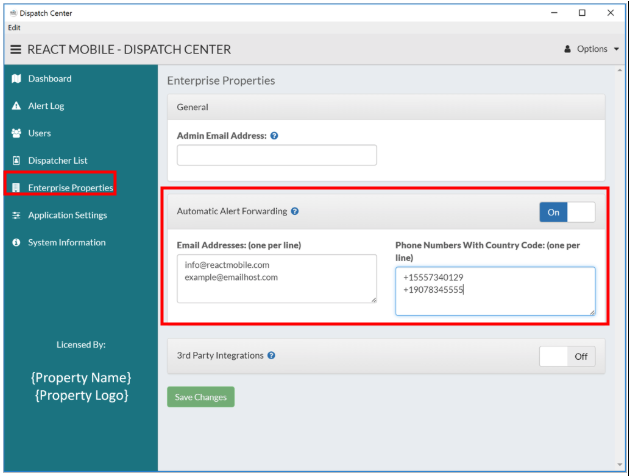 The Dispatch Center is an administrative program that allows you to manage and configure all aspects of your React Mobile solution. From the Dispatch Center you can manage active alerts, view historical alerts, manage users and dispatchers, etc. The Dispatch Center is an administrative program that allows you to manage and configure all aspects of your React Mobile solution. From the Dispatch Center you can manage active alerts, view historical alerts, manage users and dispatchers, configure the specific settings for your enterprise, and view system information. Dashboard – Shows active alerts and allows you to view detailed information or mark an alert as a false alarm. Alert Log – Toggle between active and inactive alerts. You can view detailed information about an alert or mark an active alert as a false alarm. Users – Shows all devices configured for your hotel. Devices removed from the user list will no longer be able to send alerts. Admin – Has full control of; viewing active/inactive alerts, set alerts as false alarms, add/remove dispatchers, and modify the Enterprise properties. Operator– Can view active/inactive alerts and set alerts as false alarms. Operators cannot add users or modify the Enterprise Properties. Viewer – Access to view alerts only, cannot make changes to the Dispatch Center. Enterprise Properties – Property-specific information. You can; define your primary admin, configure email and SMS numbers for automatic alert forwarding, and configure 3rd party integration information (such as HotSOS). Application Settings – Configure UI behavior for the Dispatch Center. System Information – General information about the Dispatch Center. You can add and configure which employees to be automatically notified of an employee SOS Alert. You can also configure users to have access to the Dispatch Center (see permissions above). Admin Email Address – This is the administrator of your hotel’s React Mobile installation. This email will be notified of all SOS alerts, as well as when users or devices are added or removed. Automatic Alert Forwarding – Here you can define emails and SMS numbers to receive automated notifications of SOS Alerts. Email addresses: Add each email address on a separate line. Do not use separators (such as “,” or “;”). Phone Numbers – Enter each phone number on a separate line. Each phone number must be properly formatted with country code (i.e. +[countrycode][phonenumber]) with no other characters (such as dashes)). The code for the US is 1.